Criminal behaviour continues to be a matter of major publicconcern. How society should respond to it and what should be donewith those who repeatedly offend remain hotly disputed topics ofconversation. Offender Rehabilitation and Treatment draws togetherinternationally renowned experts from the United Kingdom, Europe,North America and Australia. 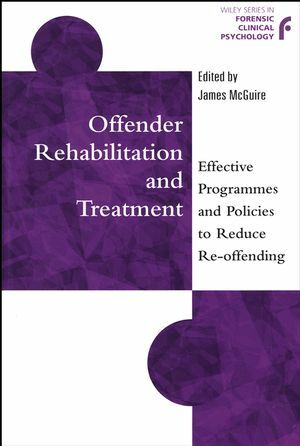 Chapters summarise some of the mostrecent and exciting developments in this field and offer asystematic, knowledge-based approach to the effective reduction ofcriminal behaviour. James McGuire is a Reader in Clinical Psychology and Programme Director of the Doctorate in Clinical Psychology at the University of Liverpool, UK. He obtained his first degree in psychology at the University of Glasgow, his PhD in psychology from the University of Leicester based on cross-cultural research carried out in Hong Kong and obtained an MSc in Clinical Psychology at the University of Leeds. He has previously held posts at the University of Edinburgh and University College London, and was for atime self-employed as a training consultant. He is a chartered Clinical and Forensic Psychologist and carries out assessment of offenders for criminal courts and Mental Health Review Tribunals. 1. Integrating Findings from Research Reviews (JamesMcGuire). 2. The Effects of Therapeutic Communities and Milieu Therapy onRecidivism (Douglas Lipton, Frank S. Pearson, Charles M. Clelandand Dorline Yee). 3. The Effectiveness of Cognitive-Behavioural Treatment Methodson Recidivism (Douglas Lipton, Frank S. Pearson, Charles M. Clelandand Dorline Yee). 4. Crime Treatment in Europe: A review of outcome studies(Santiago Redondo, Julio Sánchez-Meca and VicenteGarrido). 5. Developmental Prevention Programmes: Effectiveness andBenefit-Cost Analysis (David P. Farrington and Brandon C.Welsh). Part II: Specific Interventions, Models and Outcomes. 6. Low-level Aggression: Definition, Escalation, Intervention(The late Arnold Goldstein). 7. Intervening with Families of Troubled Youth: FunctionalFamily Therapy and Parenting Wisely (Donald A. Gordon). 8. Alcohol, Aggression and Violence (Mary McMurran). 9. Changing Beliefs of Spouse Abusers (Mary NômmeRussell). 10. Recent Developments in the Assessment and Treatment ofSexual Offenders (Anthony Be ech and Ruth Mann). 11. Serious Mental Disorder and Offending Behaviours (Paul E.Mullen). Part III: Implementation and Policy Issues. 12. Risk-Needs Assessment and Allocation to Offender Programmes(Clive R. Hollin). 13. The Policy Impact of a Survey of Programme Evaluations inEngland and Wales (Tom Ellis and Jane Winstone). 14. The Common-Sense Revolution and Correctional Policy (PaulGendreau, Claire Goggin, Francis T. Cullen and MarioPaparozzi).